Kashmir is one of the popular states of India which is popularly known as Heaven on Earth. This beautiful destination attracts many tourists every year from all around the world. This beautiful destination is set like a jeweled crown in India as it is sited on the top of the map of India. This destination in always extravagantly beautiful and attracts many tourists every year from all over the world. Strategically it is located in the northern part of India. Each and every corner of Kashmir is touched by the magic wand of Mother Nature. On your visit to Kashmir you will come across a number of tourist places. There are plenty of places to visit in Kashmir. Among the important places to visit in Kashmir are Charar-e-Sharief, Martand Sun Temple, Sudh Mahadev Temple, Hari Parbat Fort, Thicksey Monastery, Gulmarg, Pahalgam, Amarnath Ji Yatra, Sonamarg and many more. These places in Kashmir are worth visiting on your tour. 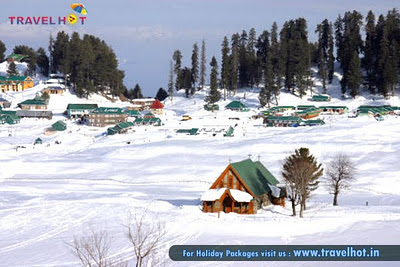 Gulmarg is one of the best places to visit in Kashmir which is located close to the capital Srinagar. The scenic beauty of Gulmarg makes it a perfect holiday destination in India. This place is beautifully studded with thousands of flowers and offers numerous adventure activities to indulge in.